with 150 hp Mercury Outboard Motors, Biminis, and stereos. Yamaha Waverunners for rent at the marina. 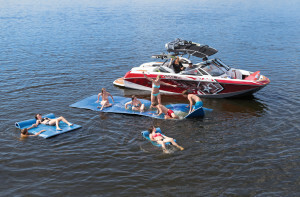 Of course, equipment for wake boarding, water skiing, or tubing is available. Life jackets are provided for all rental boats, so all you need to do is reserve your equipment and enjoy a full day of pleasure on Table Rock Lake. To keep your boat running smoothly, our Ships Store has fuel, both ethanol free unleaded and diesel, oil, additional lubricants, and all necessary items for fueling. Need a snack? Soda, snacks, and beer are all available. Already own a boat, but need a place for it to call home? Rock Lane Marina offers long-term or nightly boat slip rentals which are well-lit, camera monitored and WiFi, Cable and Electricity is available. Rest assured that boats docked at Rock Lane are in good hands. Simply call 417-338-4433 and look forward to a memorable time on the lake!